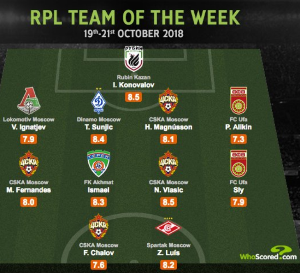 Super Eagles striker Sylvester Igboun has been named to the Team of the Week after the latest round of matches played in the Russian Premier League. Statistics website, Whoscored has picked the most outstanding players in each position with the FC Ufa star making the cut after shining in his team's goalless draw with Rubin Kazan on Saturday, October 20. Predominantly a center forward, Igboun operated from the left wing against Rubin Kazan and it's this same position that he was deployed in the ceremonial Team of the Week. In a 4-4-2 formation, the Nigeria national-teamer started in a four-man midfield which also contained Nikola Vlasic (CSKA Moscow), Ismael (FK Akhmat) and Mario Fernandes (CSKA Moscow). Igboun made his presence felt against Rubin Kazan, with a game-high three shots on target and three key passes, and had the highest number of successful dribbles with four take-ons completed. This season, Igboun, who first made his name at Danish champions FC Midtjylland, has scored 4 goals in 16 appearances in all competitions, while providing two assists.